The Six Basic Display Stands Value Bundle by XL Industries Inc. includes one each of XL’s six shortest basic display stands: 11" Basic Display Stand, 15" Basic Display Stand, 19" Basic Display Stand, 23" Basic Display Stand, 27" Basic Display Stand, and 31" Basic Display Stand. XL's basic stands are sturdy, functional and add just the right touch to any display. 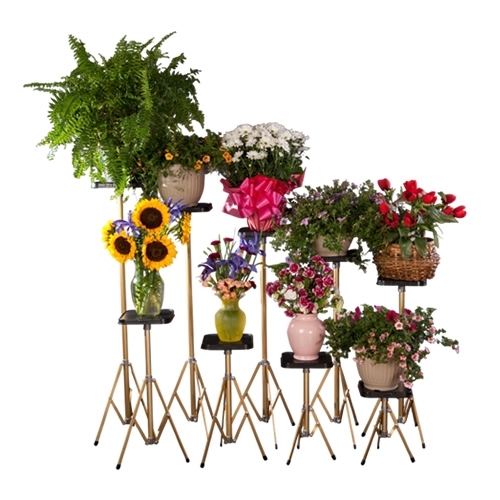 These stands are made with a gold anodized finish and are constructed with durable aluminum tubing. Non-adjustable, they have a time-proven and lasting tripod design. Vinyl feet on the legs give firm footing while protecting floors and carpets. The stands come with either an 8" or a 12" black high-impact ABS top. Previously known as "Gold Basket Stands". Flowers not included.